We took a quick trip down to San Francisco a few weeks ago and found ourselves in the middle of some unseasonably warm weather. Instead of visiting all the museums, we spent our days outdoors in Golden Gate Park. D, who used to make "snow angels" in the sand when she was 10 months old thought it was the perfect opportunity to stick Eilan's feet in the sand for the first time. Poor little guy, he looked up at me as if to say "normal ground doesn't feel this way" and started crying. His big sister has a lot to teach him. Heather on her travels on April 2, 2010 at 8:27 a.m.
Can you tell the character of a child by his reaction to sand in his toes? Perhaps he's going to be a child who likes to wash behind his ears and never gets his clothes dirty? Sharlene on April 2, 2010 at 8:54 a.m.
We were the sameway. I have one kid who loved sand at first touch and another who wanted absolutely nothing to do with it. Luckily,now they are both sand lovers because Mommy loves the beach! Cate on April 2, 2010 at 9 a.m. Sand has such a diverse feeling, cool, soft but a little gritty like acupressure. Such cute feet! DogsMom on April 2, 2010 at 9:26 a.m. Without even seeing a facial expression, you know it is Yuk! Margo on April 2, 2010 at 10:20 a.m.
Debbie on April 2, 2010 at 12:04 p.m.
Ryan on April 5, 2010 at 8:06 a.m. 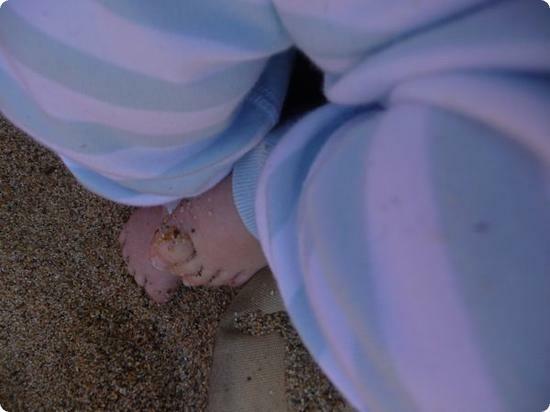 Cute, my little boy is 2 now but he still only walks on sand with his sandels. jessiev on April 5, 2010 at 8:16 a.m.
what a gorgeous photo!! LOVE IT! johnnyvagabond on April 6, 2010 at 10:28 p.m.